If you haven't been keeping up with the series but want to dive in, a new video breaks down the highlights in a quick and easy-to-understand format. Players can gain access to a host of wrestlers, and also boost their progression speed with the Accelerator. The soundtrack features artists like Anderson .Paak, Twenty One Pilots, and Travis Barker. 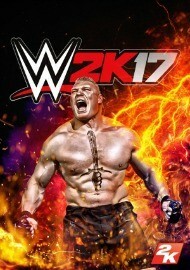 Brock Lesnar, star fighter of the game, gets an entrance video that shows off a first look at in-game footage. 2K isn't ready to leave older consoles behind.